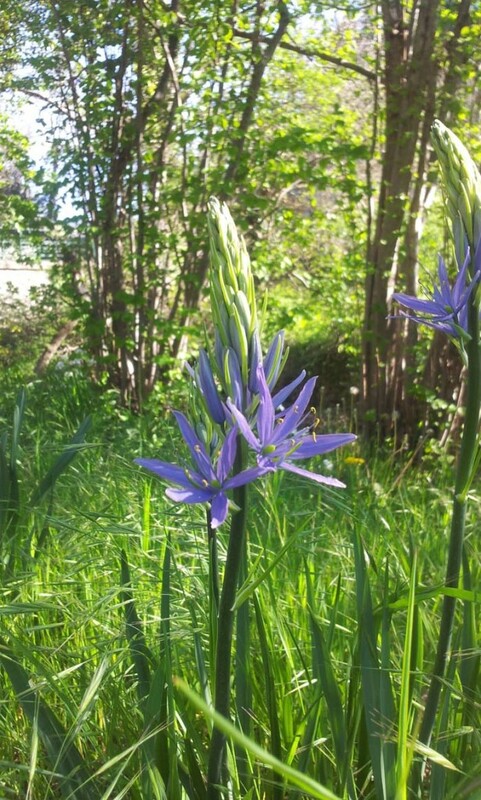 Camassias are at their best during May, after the departure of spring flowers and before the bustle of summer. Their stems are covered with individual star-like flowers that combine to create a shimmering cloud. 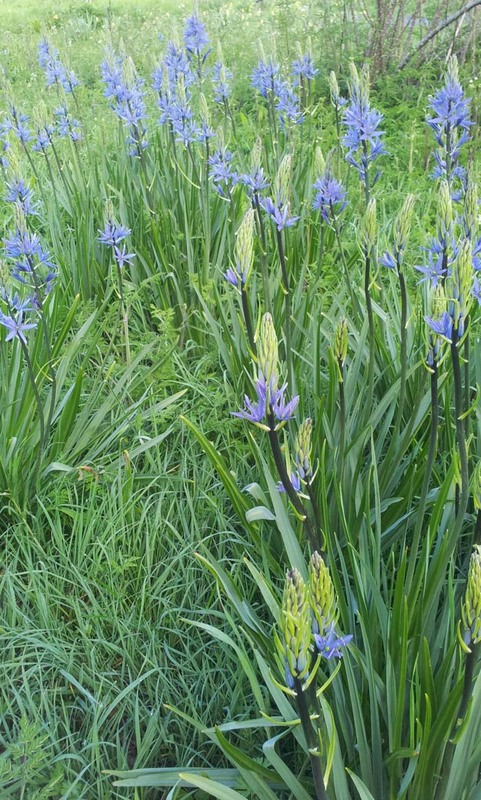 Unlike most bulbs, Camassias flourish in heavy, damp soil and will even grow in the margins of ponds and streams. If your soil is too heavy for tulips and other bulbs to thrive, try growing Camassias. C. quamash is the shortest and neatest of the genus. It has eight or ten bright blue flowers on stems about 16 inches (40cm) tall. If you can find it, Margaret recommends growing the cultivar C. quamash ‘Orion’ because it has brighter blue flowers. The rest of the group, forms of Camassia leichtlinii, are much more imposing plants, growing to between two and four feet tall (60cm to 120cm). The most common form is C. leichtlinii subsp suksdorfii Caerulea Group − a mouthful of a name that most nurseries list as C. ‘Caerulea’. The colour of the flower varies but is usually a soft-grey blue on stems 36 inches (90cm) tall. Margaret’s favourite is C. leichtlinii ‘Electra’ which, as the name suggests, has electric-blue flowers. It is sterile, so won’t seed itself about. Of the white forms, Margaret suggests C. leichtlinii subsp leichtlinii, which has cream-white flowers. The double form, C. leichtlinii ‘Alba Plena’, that thrilled Margaret so long ago, is still difficult to find. If you see it, buy it: you won’t be disappointed. Be warned though, advises Margaret, that once you start growing them you will want more. And who knows where that might lead you. The textbook advice on growing Camassias is that to thrive they need the same conditions they have in the wild: heavy, rich, damp soil. In fact they are adaptable plants and will also grow in sandy or chalky soils. Dig lots of good compost or leaf mould into the area before planting. Bulbs are available in the autumn and should be planted straight away. Make sure that the ones you buy are fat and solid, and plant them at least eight inches (20cm) deep. After they have flowered do not cut off the foliage. Allow it to die back naturally, as this feeds the bulb for the following season. Once plants are established they will self-seed, sometimes prolifically. When you’ve got enough plants cut the seed heads off to prevent them from spreading. 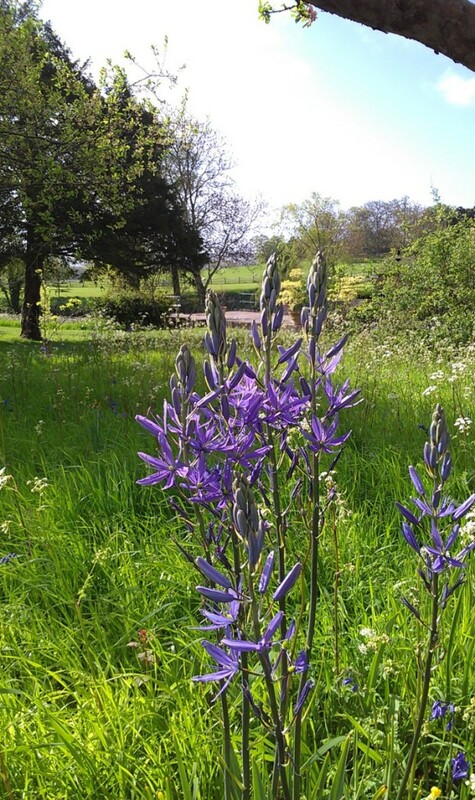 Camassias are perfect for growing in grass and meadows as long as you can resist mowing until the plant’s leaves have died down, usually by mid July. If the grass is short, plant C. quamash, which never grows to more than 16inches (40cm) tall. This is the Camassia that grows in the meadow at the late Christopher Lloyd’s garden at Great Dixter, amongst buttercups, early purple orchids and native grasses. The loftier species look better growing amongst tall grasses. In the orchard of the gardens at Glyndebourne swathes of three different varieties of C. leichtlinii are planted to give a succession of colour. Spires of the dark blue C. leichtlinii subsp suksdorfii Caerulea Group are followed by the pale blue C. leichtlinii subsp suksdorfii ‘Electra’ and, finally, by the ivory-white towers of C. leichtlinii subsp leichtlinii.